A growing demand for workers in the transportation industry means great job opportunities for anyone who likes to work with vehicles. SCTCC has three programs in its transportation department: Auto Body Collision Technology, Automotive Service Technician, and Medium/Heavy Truck Technician. 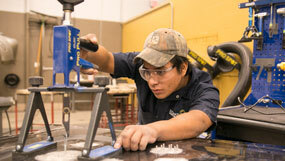 SCTCC works with regional industry leaders to make sure its programs offer the most up-to-date training and skills. Learn more about the transportation programs at SCTCC and the careers they lead to.